On Windows, the background of a running Intuiface experience can be rendered transparent. As a result, the Windows desktop and all running third party applications will be visible anywhere the Intuiface experience has no visible asset or collections. Further, the transparent background can be configured to permit interaction with the desktop and running applications. With this capability, Intuiface experiences can be designed to accommodate side-by-side use with third party apps. Those third party apps could simply be used to display information - information possibly triggered by actions within Intuiface - or they could be used directly. For example, you can use Intuiface to launch 3rd party games and permit use of those games without having to exit or hide your experience. 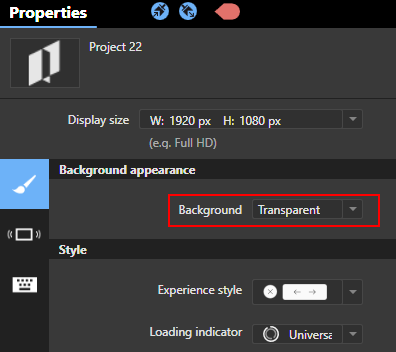 The ability to create a transparent background is only available on Windows PCs. This means you must either use 1) Player for Windows, or 2) Composer's Play Mode when set to use Player for Windows. (For more about Composer's Play Mode, see this article.). "Color" with an "Opacity" of 0. Experience layers are always transparent, it is the assets and collections you put within them that can block a view through Intuiface to third party applications. As with scene layers, only include the content you want to be visible. Select the project in the Scene Structure panel and then open the Properties panel. Transparent and permits interactivity The background will be transparent and all visible Windows applications - and the Windows desktop itself - will respond to onscreen touches and mouse clicks. Both a scene's and an experience's "Background" property are unavailable for binding. As a result, it is not possible to use these properties to toggle the transparency of a scene at runtime. However, there is a workaround. You could - in either the bottom scene layer or a background experience layer - simulate a background using a rectangle, Image asset or Video asset and manipulate the opacity of that item. With an opacity of 100%, you will not see what is behind Player. With any Opacity setting between 1% and 99%, you will be able to see what is behind Player. With an opacity of 0% you will both be able to see what is behind Player and - if "Background" was set to "Transparent and permits interactivity" - be able to touch what is behind Player as well. Intuiface Version 6: Scene to scene transitions are smoother if using a background experience layer than using a scene layer. 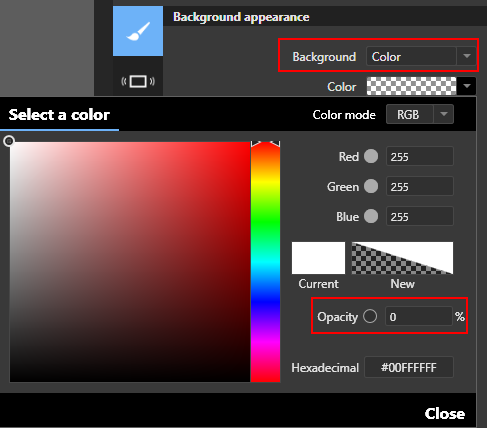 Intuiface Version 5: Scene to scene transitions are smoother if using the "Background" property of a scene to specify a color, image or video than if placing a rectangle, image or video in the Bottom layer of a scene. As a result, a desire to toggle transparency means a trade-off for smooth scene-to-scene transitions.